It’s funny how you can hear a certain song fifty times, and then hear it (or sing it) again in a different context, and it takes on a whole new meaning. “Stand By Your Man ” was co-written by Tammy Wynette and Billy Sherrill, and originally released by Tammy Wynette in 1968. It remains Tammy Wynette’s signature song and one that has been covered by other country artists many times. (In fact, I first heard this melody in a “Sesame Street” parody song.) This song, and its message to stick with your man no matter what, even became a flashpoint during the feminist movement of the late 1960s and early 1970s. “Stand By Your Man” continues to be popular and easily recognizable today. The song’s iconic lyrics start with the line, “Sometimes it’s hard to be a woman,” sung in a low, sighing tone. By the chorus, we hear the repeated cry to “stand by your man,” in a higher range and elevated energy level. On the surface, the song does seem to be about quietly bearing the burdens of a relationship with a man who is “hard to understand,” even during the moments of agony. This is a common theme to country music, and judging by other country songs, that burden could be drinking, partying, or cheating with other women. What if this song were about something else, though? The beauty of art is that the listener can interpret what they hear through the lens of their own life story, no matter what the original songwriter or singer intended. Everyone comes to a work of art with different experiences, which lends to the wealth of knowledge and understanding that we can take from art. What if this song were about caregiving? Not too long ago, I found myself singing “Stand By Your Man” with a gentleman who has dementia and who is still living with his wife of multiple decades in their family home. They’ve had a long, loving marriage, but it’s getting harder for the wife to take care of her husband. To quote the song, he’s certainly “doing things that she don’t understand” – forgetting how to put his pants on, putting the phone in the freezer, wandering around at night and sleeping during the day. 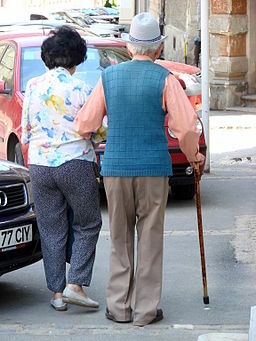 Nevertheless, she is sticking with him, standing by him through the progression of his disease. It’s hard, to be sure, but she is getting through. She loves him, so she can overlook the bad times they have now, even while acknowledging the difficulty and pain of this time in their lives. I think this song fits well as a caregiver anthem of sorts, because it acknowledges the emotional difficulty of dealing with all the pain and heartache while still encouraging a person to keep standing by the one they love. Just as you’re identifying with the pain in that line, “stand by your man” as it repeats in the chorus. maybe you can also find strength in knowing that others have been in the same place and still made the decision to stay. Could this song relate to caregiving? If you are a caregiver, why have you decided to stand by your man (or woman)? What is giving you the strength to do so? “Stand By Your Man” will be making it back on my share list given that so many in my area love country music. And, it is a great tie for discussing caregiving issues. I’ll admit that I took way too long to work this song into my repertoire. It’s a good one, and definitely popular in the Kansas City area, too! I love your song spotlights. I have never thought of that song in that context before. It totally works. Isn’t it funny how that happens? It had never struck me that way before either. I’m glad you liked it! I love the way you used the song with the gentleman with dementia! Thinking of the song from the perspective of a caregiver gave me another perspective on the song. In all relationships there are things that annoy us about our partners and visa versa. Stand By Your Man could also be a declaration of acceptance of a partner’s limitations–not the big problems commonly referred to in country music like drinking and being unfaithful, but the everyday irksome characteristics like ordinary forgetfulness or irritability.Then the song isn’t about being the long suffering woman, its about learning to accept a partner’s imperfections and not taking it personally. Thanks for sharing the way you work with clients. Music is a wonderful form of communication and you used it very creatively. Yes, Andrea, that’s another great perspective on this song! That’s the wonderful thing about exploring what artists create – there are SO MANY layers of meaning to discover. What an insightful interpretation of this song. Thank you for reinventing it for me!